Although Mexico may sound like more desert, a getaway from Tucson, Arizona, to Rocky Point, Mexico, can be a refreshing change as you enjoy beaches and lots of luxurious resorts. The four hour trip is relatively simple, and only the last hour of the drive takes place in Mexico. You need your passports so that you can re-enter the U.S. at the end of your vacation, and you need Mexican auto insurance for Tucson, Arizona, residents to comply with the law while you are driving in Mexico. Your Mexican insurance for Tucson can be quoted, purchased, and printed quickly from home or the office. The first portion of your drive from Tucson is completely in Arizona as you head toward Lukeville. The 151-mile drive is primarily on AZ-85 south. As you reach Lukeville and approach the border, you may observe stands for buying Mexican auto insurance for Tucson residents, but if you’ve taken time to handle this online, you can continue to the border crossing without wasting time or money at these stands. You may be signaled to stop at the border if officials wish to question you about your belongings or plans. However, many cross without incident and continue on Mexican Highway 8 as they head to Puerto Peñasco, better known to Arizona residents as Rocky Point. As you get away from Arizona for a day or for a week, Rocky Point offers plenty of water sports and boating activities. You can water ski, fish, or kayak in the area. You can also just sit by the pool and sip tall, cool drinks. Although you may not spend much time in your car while you are in the area, you must maintain your Mexican auto insurance for Tucson, Arizona, residents for the duration of your trip. Even an accident involving your vehicle as it is at a standstill in a parking lot could lead to problems with the authorities if you do not possess proper Mexican insurance for Tucson, Arizona residents. If you stay beyond your policy period, take advantage of Wi-Fi in one of the hotels so that you can renew your coverage. 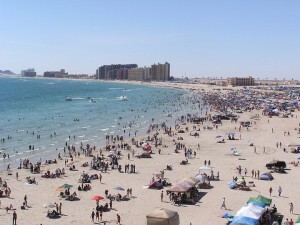 Rocky point is a great place to spend your holidays while in Mexico. I do travel to Rocky Point at least four times a year. Thanks to online Mexican auto insurance policy that I never have hassles at the border point. Previous post: When Do I Need Mexican Insurance for Canadian Drivers?